MadPotter wrote: Just thought I would include a pic of a raffle prize pot that will be at the Show this weekend. Hopefully it gets a bit of interest! I'm looking forward to see all our members tree!! Also something different on Sunday morning Lara Telford is giving her time to present "IKEBANA"
also a Beginner/ Kids workshop planned for the Sunday Afternoon. It's on .... we're up and running today and tomorrow!!! Come and say ... HI ... to us! Don't forget the lot's of GREAT STUFF on offer!!! Last edited by JR_J on June 23rd, 2018, 7:30 am, edited 1 time in total. Last edited by Marlene on June 23rd, 2018, 6:52 pm, edited 1 time in total. Imagine this when new growth starts to burst ...but with the leaves fallen... what an amazing little forest. I reckon anyway. I love this and just one more example of the type of trees on display. Hard to belief, but it's all over now and a week is gone by since our GREAT SHOW on the 23rd & 24th June! A BIG THANK YOU to ALL who were involved hands-on and who provided trees to be shown .... but also to the visitors who beat the elements - miserable, wet and cold, to enjoy what was on offer!!! The Bonsai presentation/demo from Tien, the Ikebana demonstration and the workshop for kids and beginners with Victor were greatly appreciated and welcomed by ALL ! Not to forget the interest created by the great "Treeman" working on one of his stunning trees! For the "ones" who didn't make it and missed out big times .... there's always next year!!! Thank you Davor. Quite brilliant. As member, I am very proud of this video - please spend 10 or so minutes having a look. I think it is fantastic that the club was able to put on a show like this. Yes, I am biased but a truly enjoyable weekend. 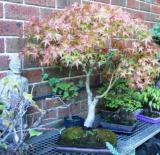 Good people, good chatter and some good Bonsai to boot. Many thanks for sharing the video, very impressive. BTW: What was the camera used? Nicely done everyone! What tree was Mike working on?